I followed the 1999 F1 season very closely from that day forward, cheering for Heinz-Harald Frentzen and team Jordan. I liked Heinz right off the bat, and was drawn to his quiet personality, and patient approach to track side interviews. When Heinz won the 1999 French Grand Prix, I was beside myself excited…a testament to how deep I had let F1 settle inside my heart. 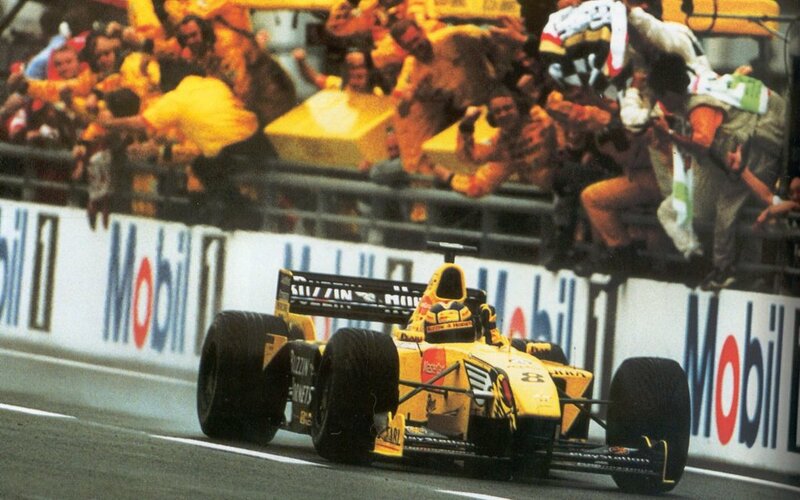 Photo: Heinz-Harald Frentzen winning the French Grand Prix. A masterfully-driven race. Fast forward to June 2000. I am sitting in the basement of my house, watching the qualifying session of the Canadian Grand Prix. I am in between final exams (Grade 10) and skipping my studying duties. In fact, I rushed through my previous test to get home in time to watch qualifying! As I watch the session, I heard both my parents slowly coming downstairs. I turned around, and could tell by the look of love on my Mother’s face that something good was about to happen. She asked if I could mute the TV for a moment, and so, I did. My Dad had something behind his back. “We have a little something for you.” He pulled a big, Formula 1 Atlas out from behind his back. “WOW, thanks so much!” I excitedly exclaimed as I jumped up and walked toward them both. “Turn to page ___.” I flipped through and found the page, and to my shock, two grand prix tickets became visible. 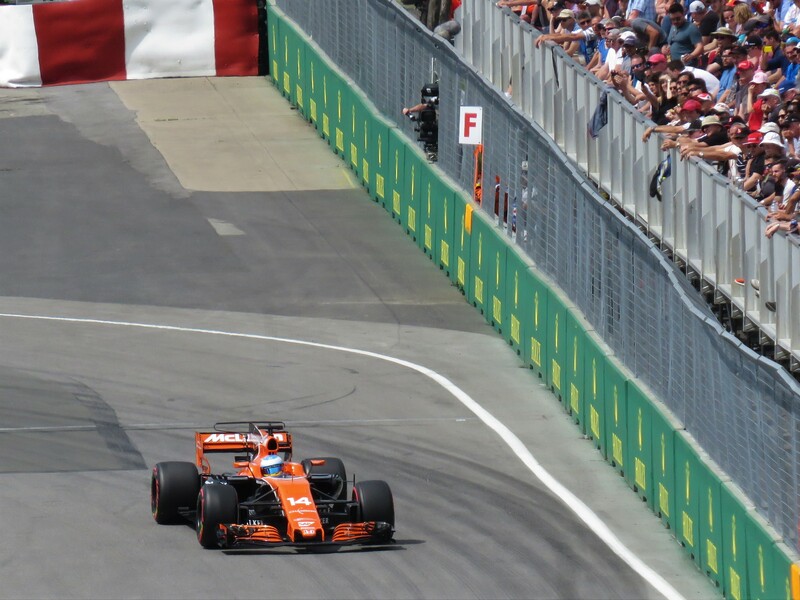 “You are going to the Canadian Grand Prix tomorrow, son.” I raised my hands up to my face, cupping them over my eyes, and began to get a bit emotional. I couldn’t help it. I was about to see these superstar drivers in the flesh, and was about to hear the eardrum-splitting wale of a V10 engine revving at over 17,000 RPM. I was about to feel each gear change through my entire body (like those big drums at the parade…only, better…much better), and was about to feel the ground shake whenever the cars passed. I was about to witness an other-worldly spectacle. The weather was absolutely gorgeous, with true Miami heat all weekend. 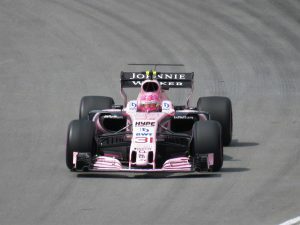 The new breed of Formula 1 car is the most beautiful I’ve seen; numerous times over the weekend, I shook my head in awe. The immense mechanical grip to the new cars meant that driver’s were even later on the brakes into the hairpin than they were the previous year. 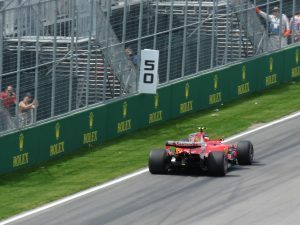 I estimate that some drivers were hitting the brakes at only 80-85 meters out from the hairpin, meaning they were slowing from 310 km/h to 65 km/h in only 80 meters. I watched with my binoculars, and believe I could see the moment the drivers hit the brakes, because the car would very suddenly jolt downward. 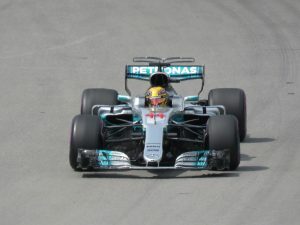 Often, when the brakes were applied, sparks flew out the rear of the car as the underplank of the car pressed against the tarmac. The G-Force involved in that sort of incredible shift of energy is very likely 5-5.5 G’s. 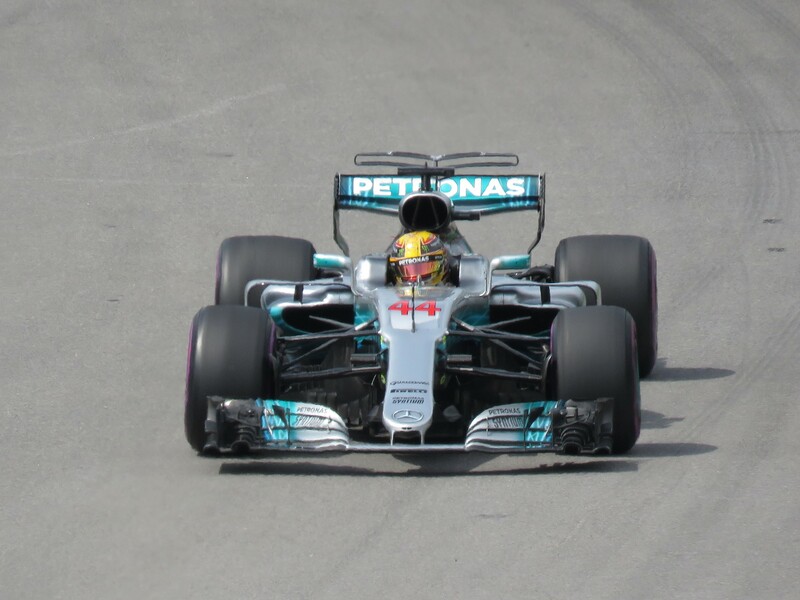 All weekend it was Ferrari vs. Mercedes; specifically, Vettel vs. Hamilton. There was very limited middle ground…a fan basically had to choose one side or the other! The fans next to me were stone cold silent all weekend, meaning I could lose myself, entirely, in the experience. I treated my Dad to an early Father’s Day gift, and purchased a Greyhound bus ticket for him so he could bus down on Sunday morning, and take in the grand prix from downtown Montreal. We met after the race and had a wonderful dinner on Rue Peel! We strolled around after our meal, taking in the ambiance, before heading back to Ottawa in the evening. Thanks for reading. Back to birding after a perfect vacation! Cheers.